You would like to be informed about Daniel Spoerri's new arrivals in advance? Register now for free! Through various acquaintances with artists like Joseph Beuys, Marcel Duchamp, Yves Klein and Man Ray he is part of the most famous contemporary artists. Daniel Spoerri was born, as Daniel Isaac Feinstein, on March 27, 1930 in Galaţi (Romania). He and his parents lived the first years in Romania until Spoerris father Isaac Feinstein was murdered by the Nazis. Then his mother Lydia Feinstein-Spoerri escaped in 1942 with her son to Switzerland. Spoerris mother was Swiss-born and after the escape they lived with her brother Theophil Spoerri in Zurich. He adopted the artist later and Spoerri took on his name. The young Spoerri was a commercial apprentice. After this he worked in various jobs to finance his maintenance. Among other things, he was a bookseller, photographer and seller of food. Later in 1949 he began to study the classical dance and pantomime. He studied in Zurich and Paris. In 1954 he completed his studies and worked successfully as a dancer at the Stadttheater in Bern. There he danced mostly avant-garde-plays and made a name in the dancer scene. During this time Spoerri made his first experiences with art in the form of several short films. His initial attempts left impression on many acquaintances like Meret Oppenheim and Dieter Roth. Spoerri was between 1978 and 1982 professor for three-dimensional presentation at Kölner Werkschulen. Later, he was appointed to the Akademie der bildenden Künste in Munich and taught there until 1989. Daniel Spoerri was one of the most famous contemporary Swiss artists. 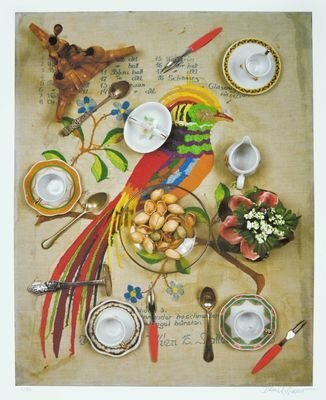 He was the inventor of the so-called Eat-Art and one of the Swiss object-artists. In 1959, Spoerri moved to Paris in order to establish himself as an artist. There he met various artists like Yves Klein and Man Ray and he dealt with the art of the French representatives of object-art. In Paris he made his first object-art. In the same year, Spoerri founded the Edition MAT (Multiplication d'Art Transformable). The Edition MAT was the first edition, which showed reproduced objects (Multiples). This art-form is very common nowadays. 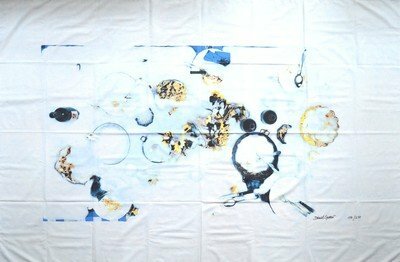 Numerous artists such as Christo, Heinz Mack and Marcel Duchamp were shown in the Edition MAT with their works. In 1960 Spoerri founded the artist group Nouveau Réalisme in France together with Pierre Restany, Yves Klein and Raimond Hains. Spoerri and other artists of the group dedicated to the world-famous snare-pictures (tableaux pièges). 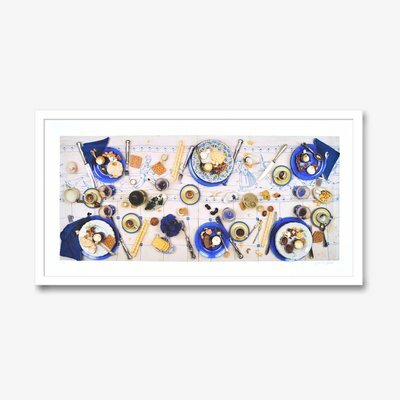 The snare-picture showed a kind of snapshot of an everyday occurrence, like a meal. By alienation of objects, the viewers were trapped. Through this, a different view was given to everyday objects. Spoerris art should be directed by chance, so that the viewer finds himself in a familiar situation. In 1961 Spoerri was part of the exhibition The Art of Assemblage at MoMa (Museum of Modern Art) New York. The museum bought one of his works (Kichkas Frühstück I) and from then Spoerri had a value of international recognition. 1968 Spoerri opened the Restaurant der Sieben Sinne in Dusseldorf. In addition he opened the new founded Eat-Art-Gallery. Spoerris idea of Eat-Art emerged from his snare-pictures. 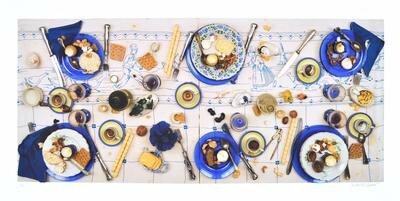 Spoerri put food to artistic, by fixing and adding other materials he developed this contemporary art direction. This made it possible, that food and drinks became part of the art scene. The viewer could see them in a different way in the room. For Spoerri it was important to capture a part of everyday events in his works. He looked at eating and drinking as a piece of a cycle. Spoerris theme of food should take a closer look in the question of eating habits and taste. In Spoerris restaurant several actions and performances by artists like Joseph Beuys took place. In the Eat-Art-Gallery Spoerri continued to several banquets, where his art was shown. In 1972 the restaurant closed. To expand his Eat-Art, he created a number of Brotteigobjekte in the 1970s. Among these you can see a merging of different everyday objects and bread dough. Spoerri baked objects like electric irons or car seats with dough together in the oven. So the bread debouched his own way through the small openings to swell. He alienated the food and the object of their actual function. After giving up his German restaurants and the Eat-Art-Gallery, he moved to Tuscany. There he opened the artists garden Il Giardino. Spoerri made numerous sculptures for this overwhelming sculpture garden and he is currently constantly working to expand this. Also other artists are shown in the 14 -hectare estate. In 1998 Spoerri was author of the book Anekdoten zu einer Topographie des Zufalls (anecdotes about a topography of chance). Spoerri examined everyday objects such as coins and bottles at their origin and meaning, and commented this with sleek anecdotes. Since 2007 Spoerri lived and worked in Vienna. In Austria he has revived his old Eat-Art-Idea again. In 2009 he opened an Eat-Art-Restaurant and an exhibition space in in two houses on the market square in Hadersdorf am Kamp. The exhibition hall is named Ab-Art. Daniel Spoerri. 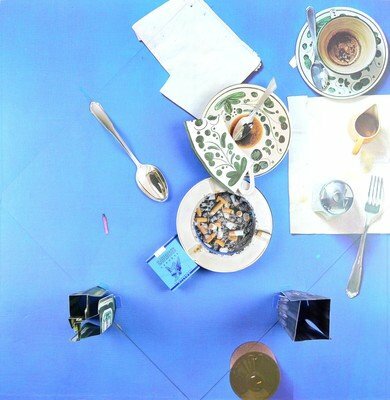 Jeteur d’Objects, Rolf Wäber, France/Switzerland 1993, ‚’58. Les Nouveaux Réalistes, Adrian Maben, Germany 1989, ’60. Le Manège de Petit Pierre, Daniel Spoerri/Marie-Louise Plessen, Germany 1979, ‚’10. Il Spoerri. Oder es gibt, exhibition catalogue, Galerie Hamburg, Bielefeld/Berlin 2015. Daniel Spoerri. Waschbretter, Waschrumpeln, Waschrubbeln, Wash Board, exhibition catalogue, LEVY Hamburg, Bielefeld 2013. Historia rerum rariorum. Daniel Spoerri, exhibition catalogue, Museumsberg Flensburg, Bielefeld 2013. Daniel Spoerri. Weißt Du, schwarzt Du?, exhibition catalogue, Museum Bahnhof Rolandseck, Bielefeld 2010. Daniel Spoerri. Von den Fallenbildern zu den Prillwitzer Idolen, exhibition catalogue, Kunsthalle Jesuitenkirche Aschaffenburg, Bielefeld 2010. Daniel Spoerri. Ein Augenblick für eine Ewigkeit, exhibition catalogue, Kunsthalle Krems, Nuremberg 2010. Daniel Spoerri: Nouveau Réalisme, Vienna 2005. Daniel Spoerri: Journal Gastronomique, Geneva 1998.